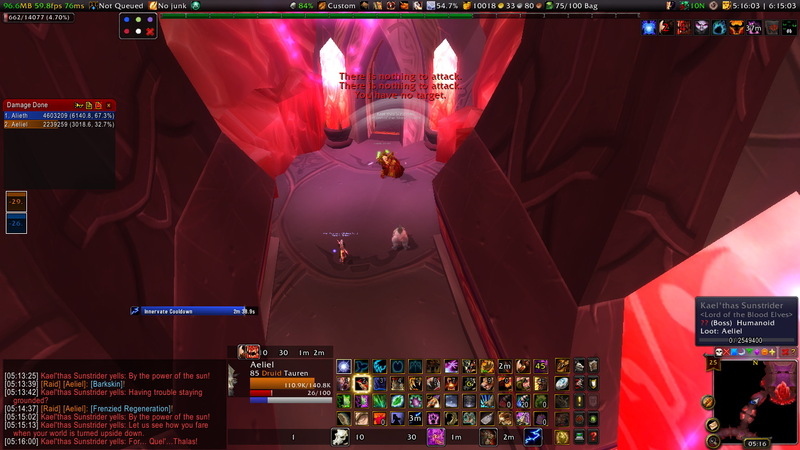 We two-manned Kael’thas Sunstrider. No, not the one in Magister’s Terrace – the raid boss. For all of these, pick the question mark icon. I also like naming them with just a space, so they look like perfectly normal abilities. This macro will cast Feral Faerie Fire in bear or cat form, and normal Faerie Fire in all other forms. (This includes flight form, aquatic form and travel form as well as caster form; keep in mind that I don’t have tree or moonkin form, so you may need to adjust if you do – although why you’d want to cast Feral Faerie Fire if you’re a shrubbery or critchicken I don’t really know, but hey.) The tooltip will match the spell the macro casts, and the icon will display the spell’s cooldown when you’re in feral forms. One press casts Enrage. The second press will cancel the buff that generates additional rage and makes you take 10% extra physical damage. More often than not, I find the extra damage taken doesn’t make all that much difference (at least Alieth, the pocket healer, hasn’t yelled at me for taking too much damage yet), and it certainly helps the rage generation. It’s a good thing to have for when I’m tanking stuff that hits really hard (so I don’t want to take extra damage) but I’ve just had a dodge streak so I need a quick rage boost to keep ahead of the DPS, especially at the start of a fight. If you have a mouseover target and it’s alive and hostile, this macro lacerates that mouseover target. Otherwise it lacerates your target. I’ve had this macro since back in the good old TBC days of druids failing epically at AoE tanking; these days it’s even better, since you can have Lacerate stacks running on multiple targets and doing so increases the chance of getting a free Mangle to proc. For those of us with Stampede. In its normal state, the macro will show Feral Charge; the first press will Feral Charge, then the macro will switch to Ravage and remain there for 10 seconds (the duration of the free Ravage buff). After 10 seconds, it switches back. I originally tried doing it without the 10-second reset, but it kept showing Ravage rather than Feral Charge when I shifted out of cat form and back in. This works for me. Just a quick note – and this is absolutely not a fancy strategy, and I can’t believe there aren’t more people doing this on my server (but then again, the less people doing this the more profit for me). Whenever I’m in Deepholm, I make sure I fish some Albino Cavefish. It’s only used for one thing – Deepstone Oil, from Alchemy – but every alchemist will be making a handful of those for skillups, plus they’re reagents for the Vial of the Sands mount. The Therazane dailies (which I do for reputation, gold and the chance at achievements – although I still haven’t seen the Pebble daily nor the Fungalmancer Glop daily, grrr) take me right to a place with plenty of pools (the Crimson Expanse, at about the 3-o’-clock position on the map), and I’ve never seen anybody else fish these pools. There are also some pools further south, at the Silvermarsh, but I rarely bother with those. The price has remained pretty steady on my server, at 8-10g per fish (160-200g per stack). I only fish what pools I see while doing the dailies in the Crimson Expanse area; it takes about 15 minutes of my time per day, and I usually come out with one and a half or two stacks of the fish. Considering I still don’t have fishing capped and I’m still missing the Sea Turtle (and it’s been confirmed to drop from Cataclysm pools, thank you Blizzard for small mercies), it’s not a bad gold return for something I’d be doing anyway. By the time I log in to do my dailies, the fish I caught the day before has sold; there is very little competition. Sure, I could be fishing for Fathom Eels in Uldum – but that’s a pain, since the fishing pools are affected by phasing and as a result there’s a whole clump around Schnottz’s Landing. There’s also plenty of competition, the fishing path is long, and the prices keep dropping to the point that on bad days, they’re below the Albino Cavefish. Other fish has similar issues. This is all your fault. You stay up raiding late and then you sleep through the morning and you won’t wake even if I tell you to. I had to log you in myself and drag your character to the Crumbling Depths. Manually, since you clearly did something wrong and there’s no portal to Therazane’s Throne in the Temple of Earth as far as your character’s concerned. Then I get you there and find out you cannot see the bloody goblin. So I have to climb down on my character and plant a bomb under your scrawny troll behind. Several times, because I guess trolls fly differently than tauren do or something and you wouldn’t fly the right way. And then I have to fight using your character and I have no idea what shamans do and I have to just mash keys at random and hope for the best. Including figuring out your weird healing keybinds so I can keep your scrawny troll from dying. And then I have to take an ugly screenshot because I’m too busy fighting to figure out how to get rid of your weird bright middle-of-the-screen Power Auras notifications. And then, to add insult to injury, I get killed by a gyreworm because I’m paying too much attention to your character and not nearly enough to mine. In conclusion, I hate you. 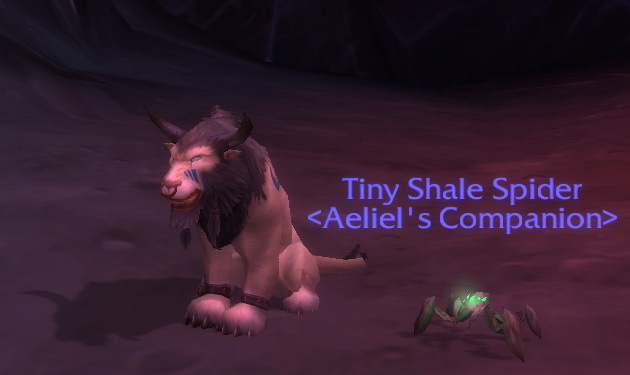 I was not expecting to get the Tiny Shale Spider vanity pet quite so soon. I got the daily the first day after I finished Deepholm, and every time I went to Deepholm I checked if Jadefang was around – but I’d had no luck so far. Then today Alieth asked me if I could go fish him some Lavascale Catfish. Fishing in open water is dull, especially since the fish he wants has a 20% or so fish rate and he wanted two full stacks, but I’m terrible at saying no when he asks me for a favour. And since I was in Deepholm, I thought I might as well check for Jadefang. I didn’t think she was going to be around. …and she spawned right in front of me.